It’s not to long ago (sometime in June 2017) when Oppo surprised her fans and the smartphone world with the Oppo R11. That’s less than 2 months. 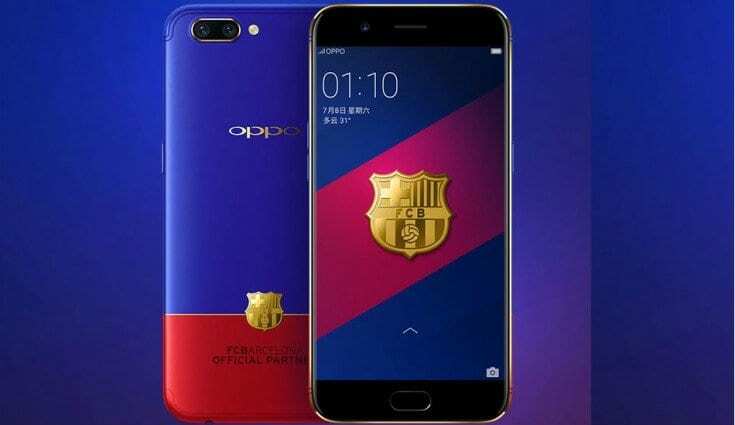 Now, to celebrate her partnership with top European club, FC Barcelona, the Chinese smartphone company have released a special/customized Edition of the Oppo R11 smartphone. And trust me, it is beautiful! The smartphone will go by the name “Oppo R11 FC Barcelona Edition”. The device was designed in a fashion that resonates the club’s official colours; Red, Blue and Burgundy. The back/rear of the device houses the beautiful club colours as well as the club’s logo at the 3rd quarter of the device. The logo is an 18K gold-plated Barcelona emblem. Just like the ordinary version of the Oppo R11, the new Oppo R11 FC Barcelona Edition Oppo R11 Barcelona Edition also comes with a 5.5-inch AMOLED Full HD 2.5D curved glass display that is duly protected by the latest Corning Gorilla Glass 5. The display has same 1920 x 1080 pixels resolution. A 2.2GHz Qualcomm Snapdragon 660 Octa-core processor and an Adreno 512 GPU also powers the FC Barcelona version of the Oppo R11 smartphone. The dual camera set-up on the rear are 20-megapixels and 16-megapixels shooters which both enjoy a LED flash support. The selfie camera upfront on the other hand is a single 20-megapixels shooter but without LED flash. Storage-wise, the Oppo R11 Barcelona Edition comes with a huge 4GB of RAM and 64GB of internal storage, which can be further expanded up to a massive 256GB via a microSD card. The Oppo R11 Barcelona Edition, like the ordinary version, likewise runs on the latest Android 7.1.1 Nougat OS alongside Oppo’s ColorOS 3.1 FC Barcelona-themed custom UI skin. However, despite the numerous similarities shared by the ordinary version and the FC Barcelona Edition of the Oppo R12, there’s a slight downgrade in the battery capacity. The FC Barcelona Edition has a 2,900mAh battery capacity, 100mAh lesser than the ordinary edition which has a 3,000mAh battery. It would also be worth mentioning that Tecno Mobile also released a Manchester City Edition of the Tecno Camon CX smartphone to celebrate her partnership with the English football club. Although the Oppo R11 FC Barcelona Edition has been announced, it will only be made available for purchase in China starting from August 18 (Friday) at exactly 10 AM via Oppo’s official online retail store. You can get a unit of the Oppo R11 FC Barcelona Edition Priced for US$523 only. That’s about N180,000 in local currency. Any Barcelona loyalist(s) reading this willing to shell out such amount to prove his/her loyalty to the European club?